Mike Ullery | Daily Call Authorities investigate a crash at the intersection of Piqua-Lockington and Landman Mill Road on Thursday morning. Two persons were transported by Piqua Fire Department medics with non-life-threatening injuries. The crash is under investigation by the Miami Co. Sheriff’s Office. 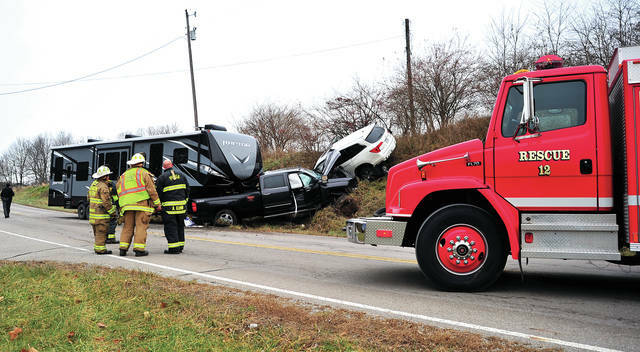 Authorities investigate a crash at the intersection of Piqua-Lockington and Landman Mill Road on Thursday morning. Two persons were transported by Piqua Fire Department medics with non-life-threatening injuries. The crash is under investigation by the Miami Co. Sheriff’s Office. https://www.dailycall.com/wp-content/uploads/sites/30/2018/12/web1_120618mju_crash_piqualockington.jpgMike Ullery | Daily Call Authorities investigate a crash at the intersection of Piqua-Lockington and Landman Mill Road on Thursday morning. Two persons were transported by Piqua Fire Department medics with non-life-threatening injuries. The crash is under investigation by the Miami Co. Sheriff’s Office.